The New York Giants represented the NFL in the sixth installment of the College All-Star Game in Chicago on August 30, 1939. They faced an All-Star squad coached by Elmer Layden, head coach of Notre Dame and a former member of that school’s famed “Four Horsemen” backfield. The Giants were coached by Steve Owen, who had guided the club to two NFL Championships in eight years, including the 1938 season. New York had an able passer in tailback Ed Danowski and could run the ball effectively, most notably with FB Tuffy Leemans carrying. C/LB Mel Hein was coming off of a season in which he had been named MVP by the league and the team allowed few points on defense. 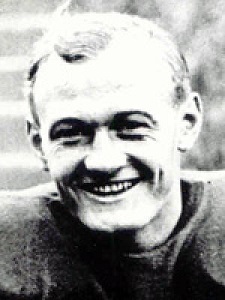 Returning to the club was Ken Strong (pictured above), a former star fullback and placekicker who had jumped leagues after the 1935 season but was back at age 33. The All-Stars had won the previous two contests and this year’s roster included future pro stars in center Charley Brock from Nebraska, Pitt HB Marshall Goldberg, FB Bill Osmanski of Holy Cross, and the diminutive Heisman-winning QB Davey O’Brien from TCU. There were 81,456 fans in attendance for the Wednesday night game at Soldier Field. The All-Stars were in trouble early when Davey O’Brien fumbled the game’s first punt and end Jim Poole recovered for New York. However, the Giants were unable to capitalize when Ward Cuff missed a field goal from 41 yards by inches. Following an exchange of punts, the Giants again moved into scoring territory thanks to good runs by FB John “Bull” Karcis and Cuff. Cuff kicked a 34-yard field goal late in the first quarter to put the Giants in front. In the second quarter, New York put together a 56-yard series that led to another field goal, this time by Ken Strong from 22 yards, to take a 6-0 advantage. The All-Stars responded by driving from their 28 to the New York 39, with the big play a 15-yard run by Bill Osmanski. However, a second-down pass by Michigan State back Johnny Pingel was intercepted by LB Kayo Lunday to end the threat. The Giants attempted to add to their advantage in the third quarter with a drive to the All-Star 13, but came up empty when O’Brien intercepted a pass. The pro champs mounted another strong possession to the All-Star two, but Cuff’s try for a field goal hit the upright and bounced away. Following more punts which included a quick-kick by the Giants that pinned the All-Stars back at their 20, New York got another field goal, again by Strong, who connected from 41 yards. The All-Stars finally mounted a threat in the fourth quarter with Baylor QB Bill Patterson in the game, who threw the ball effectively. But drives to the New York 11 and 17 were blunted by interceptions by DB Len Barnum and LB Doug Oldershaw, respectively. The Giants came away with a 9-0 win in which they were more dominant than the score indicated. The Giants, who controlled the line of scrimmage and kept the collegians bottled up on their side of the field for most of the game, had the edge in total yards (199 to 166) although the All-Stars had more first downs (10 to 9). However, New York intercepted five passes. Bill Osmanski (pictured at left) and QB George Faust from Minnesota drew praise as the best of the All-Star rushers. The win for the Giants tied the series, which was far more competitive at that point than it would be in the ensuing years of its existence, at two wins apiece, with two ties. New York again topped the Eastern Division with a 9-1-1 record during the regular season but lost in a title rematch with the Green Bay Packers. 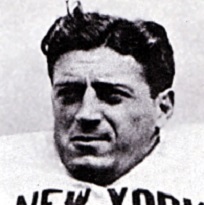 Bill Osmanski played seven years in the NFL with the Chicago Bears and led the league in rushing as a rookie in 1939. Davey O’Brien also had a fine first year with the Philadelphia Eagles, passing for a NFL-high 1324 yards in his first of two pro seasons before leaving to join the FBI.